The first half of 2018 in the Lithuanian housing market was one of the most active over the past decade and was comparable to those of 2016–2017 both in the apartment and private house sectors. Despite slightly pessimistic moods prevailing early in the year in the housing market of the major cities of Lithuania. ‘In February, a record low activity in the apartment sector of the country’s capital and, for the first time after a longer period of time, a symbolic fall in sales prices were recorded), in the first six months of the year sales and prices shot up yet again. Of course, very different trends can be observed in different regions or cities of the country – from decreasing to rising indicators in the market activity and diverse price changes,’ Raimondas Reginis, Ober-Haus Research Manager for the Baltics, said. According to the State Enterprise Centre of Registers, 0.2% fewer purchase and sales transactions for apartments and 0.3% fewer transactions for private homes were concluded in the first half of 2018 than were concluded in the same period in 2017. In the first half of this year, on average 2,668 transactions for apartments and 820 transactions for houses were concluded per month. May saw the largest number of housing transactions totalling 4,148. This is the second best performance in the month in the Lithuanian housing transaction market since 2007. A larger figure was recorded in September 2016 (4,205). Currently, sustainability of new housing developments in the capital city has been most debated, as since Q3 2017 the realization curve for newly constructed apartments (first-time sold and reserved new apartments in multi-apartment buildings that have been completed or are being constructed) has moved downward and over the past four quarters has remained stable with an average of 800–900 apartments per quarter. According to Ober-Haus, in the first half of 2018, 1,789 new apartments in multi-apartment buildings that have been completed or are being constructed were purchased or reserved in Vilnius directly from developers. This is 5% more than in the second half of 2017, but 17% less than in the first half of 2017. The Ober-Haus estimates reflect the transactions which are immediately officially registered (on the purchase of the property in a completed building) and the transactions based on the preliminary contracts, which will be registered with the State Enterprise Centre of Registers in the future, after the completion of the multi-apartment buildings. Meanwhile the State Enterprise Centre of Registers in its statistics for apartment purchase and sale transactions records only final transactions, which shows the opposite situation – the increasing number of transactions for new apartments reaching record heights in Q2 2018 when the acquisition of 1,268 new apartments was recorded in the city of Vilnius (best quarterly result since 2007). Based on the data of the State Enterprise Centre of Registers, the result of the first half of 2018 is also the best since 2007–2008. This shows that currently finalised and recorded transactions for new apartments were recorded and figured in the Ober-Haus estimates back in 2016–2017, i.e. at the time when the preliminary purchase and sale contracts for these apartments were concluded. Thus the housing market is currently absorbing almost a record amount of borrowed or own cash spent on housing purchase over the past decade. At the same time, slightly negative trends in the new apartment sales prices in Vilnius have been observed over the past six months. If the prices for old apartments in the capital city in the first half of 2018 increased by 1.6%, so the prices for new apartments fell by 0.3%. ‘Although this is a slight decrease in apartment prices, such trend has been recorded for the first time over the past three years. Last time the price decrease trend (for both new and old apartments) was recorded in Vilnius in the second half of 2014, when the then geopolitical situation had a negative impact on both the country’s business and people,’ Mr Reginis said. Current slight downward move in the price curve of newly constructed properties can be linked to a really significant and sufficient supply of new housing, which prevents a considerable portion of developers from increasing their sales prices as easily as they did before and they even have to compete for more attractive prices with other competitors. The developers have also gained speed in the second largest city in the country. This is in particular visible in the development of multi-apartment buildings over the past few years. According to Ober-Haus, a total of 633 apartments were built in multi-apartment buildings in 2017 in Kaunas or 92% more than in 2016. In 2018, developers in Kaunas plan to complete up to 1,100 new apartments and thus repeat record development indicators recorded a decade ago. This year alone, apartments in 30 different projects will be offered to buyers. For example, in 2008, 1,070 apartments in 15 different multi-apartment building projects have been built for sale. This means that due to the abundance of different projects, customers this year will have even greater choice than 10 years ago. Faster development of new multi-apartment buildings, which started in Kaunas in 2016 determined record new apartment realization indicators in 2017, when over 840 apartments were purchased or reserved directly from developers. I.e. buyers responded to the new supply with great interest and actively participated in purchasing completed apartments or apartments in progress. 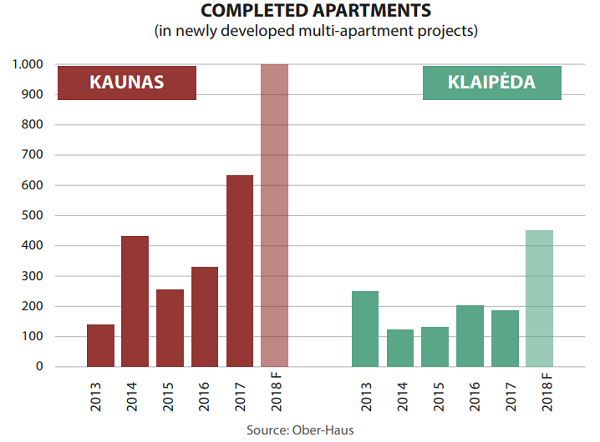 According to Ober-Haus, in the first half of 2018, 356 new apartments in multi-apartment buildings that have been completed or are being constructed were purchased or reserved in Kaunas directly from developers. This is 17% less than the number of apartments realized in the second half of 2017 and 15% less than the first half of 2017. 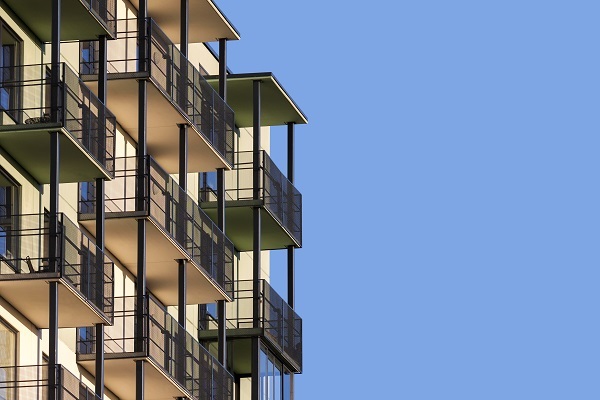 Despite the more modest figure for the sale of new apartments in 2018, the overall housing market activity in the primary market is by a quarter higher than in 2016. ‘Further new housing realization indicators will depend not only on the overall economic situation both in the country and in Kaunas region, but also on the scale of further development of new projects. So far housing developers are seen to have put their trust in Kaunas and do not plan to stop. Positive trends in the sales prices of new apartments were recorded over the past six months in Kaunas,’ Mr Reginis said. In the first half of 2018, the prices of new apartments in Kaunas increased by 1.9%. Although the scale of development of multi-apartment buildings in Klaipėda cannot be compared either to Vilnius or Kaunas, growth trends are visible here. On average only 200 apartments were built in Klaipėda in multi-apartment buildings annually in 2010–2017. ‘Since the number of newly built, but unsold apartments from previous projects is rapidly decreasing, quite favourable (low) competitive environment remains in the city. While the overall activity in the housing market has showed good results, developers in Klaipėda started developing new housing projects more actively. As a result, in 2018 much greater changes in supply have been recorded,’ Mr Reginis said. According to Ober-Haus, this year 450 new apartments in 12 different projects should be completed in Klaipėda. For example, this year will see the completion of one of the largest multi-apartment buildings in the past 3–4 years in Klaipėda. The multi-apartment building Ravelino Namai in the Old Town will offer over 130 new apartments. Apartments for sale are offered not only in newly completed projects, but also in non-standard projects: apartments are reconstructed for sale in the former student hostel on Taikos Avenue or in place of the former Saturnas shopping centre (Saturno Namai). According to Ober-Haus, in the first half of 2018, 163 new apartments in multi-apartment buildings that have been completed or are being constructed were purchased or reserved in Klaipėda directly from developers. This is almost 14% less than in the second half of 2017 and 22% less than in the first half of 2017. The relatively poorer indicators this year were partly determined by very large sales volumes of newer apartments in 2017, when the buyers showed great interest in both the newly constructed projects and the apartments built much earlier, but not sold yet. By mid-2018, 63% of the apartments planned to be built this year were sold or reserved. In the first half of 2018, the prices for new apartments in Klaipėda increased by 2.7%. In Šiauliai and Panevėžys the volumes of development of new housing still remain very modest, but housing developers offer new apartments in small-scale projects. According to Ober-Haus, in 2014–2017, 1–3 new apartment development projects (or stages thereof) were implemented in Šiauliai and Panevėžys each year and in the past four years only slightly more than 100 apartments were built for sale. In 2018, four new small projects are planned in Panevėžys, which will offer 45 new apartments. In Šiauliai, a multi-apartment building which will offer 36 apartments is being built on Daukanto Street; its completion is scheduled for the end of this year or the beginning of 2019. Recent growing supply of new apartments affects sales volumes of the new housing. 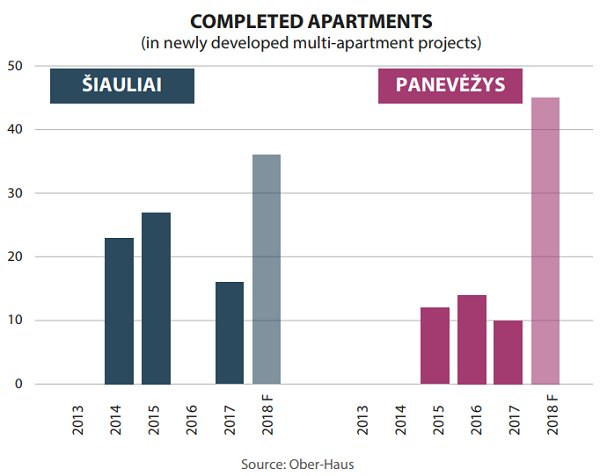 According to Ober-Haus, in 2017, 35 new apartments in multi-apartment buildings that have been completed or are being constructed were purchased or reserved in Šiauliai and Panevėžys directly from developers. In the first six months alone, 32 of them were purchased or reserved. ‘It is clear that the newly built apartments in these cities have found their buyers. Although these figures indicate a growth trend and more new apartments are sold, they still do not match the sales volumes which were a decade ago,’ Mr Reginis said. The construction volumes of multi-apartment buildings in 2014–2017 in Šiauliai and Panevėžys were on average 8 times smaller than those in 2007–2008 when 430 apartments were built in these cities just over two years.